I got the audiobook for this one, read by Jennifer beals, Benjamin Bratt, Judy Greer, Robinne Lee, Pablo Schreiber amongst others. I was drawn to it because I couldn’t remember ever having seen an audiobook that was cast like a movie, with amazing actors and voices for each of the characters. I started it and I was so surprised to find it written as a bunch of interviews and presented like you would see a documentary edited together people talking about the same thing (but with no narrator). The story is given through commentary. Cool. At least for the first hour. Then I remembered that I can’t stand this way of “reading” – I’ve read books that are written only as e-mail correspondence, letters, diary entries or dialogue and it’s not my favorite genre. To me, personally, it gets tedious. I like breaks in the book with this stuff, that’s interesting to me, but reading the whole book like that is too much. Listening to it felt like a podcast that wouldn’t end! That being said, the actors are amazing. They set the tone, and make the characters in this audiobook come alive like nothing I’ve ever listened to before! Which, props to the author, shows great dialogue writing! It’s so natural and effortless and it sounds like a real interview documentary! So if you like that sort of thing, this has to be one of the best books come your way in a long time! What struck me as a *little* odd was the way they acted out some things, with VERY much emotion. It felt a little over the top when this is an interview after the fact. Rarely do people get out of breath when speaking about that time they ran so fast they got out of breath. You feel me? Those moments felt a little like those radio acting shows, you know? If you’re anything like me, I’d opt for the audiobook, it gives more feel of the story than reading the dialogue yourself. Have a read this myself, I wouldn’t have finished. But that’s because I don’t enjoy this particular way of reading and has nothing to do with the story or writing. The story is great, and I’m excited to see them turn it into a series. And I’m excited to actually *hear* the songs I’ve heard so much about. 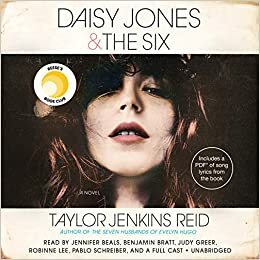 Posted in Anie's Bookclub and tagged Audible, books, Daisy Jones and the six, fiction, music, Realistic fiction, Taylor Jenkins Reid. Bookmark the permalink.